Trust me, a pair of great fitting denim instantly makes an outfit looks more pulled together. I'm rocking a high-waisted straight leg cropped denim from Fancy Pants. High-waisted denim will change your life. The belly button is almost covered is probably what a binky feels like to a baby: safe and comforting ;) I paired it with a simple sweatshirt from Everlane and my favorite go-to in the shoe arsenal, ankle boots. Casual wear should be fuss-free so I choose accessories to elevate what I'm wearing. 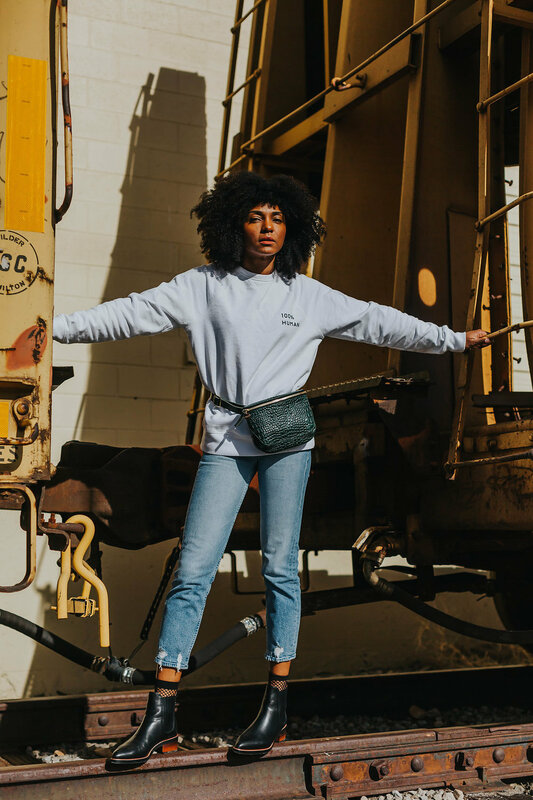 This Clare V fanny pack is packing (tehe) so much COOL! It leaves me hands-free as I get through my day and it adds a little extra style to a simple outfit. The fishnet socks are another fun surprise. It takes little effort and makes comfy wear sassy. Blending casual wear with dressier styles gives the "I tried" look to an outfit. These Coach ankle boots can easily be dressed up or down. Their chic simple style lends a polished addition to my sweatshirt and jeans combo. This high low mix can be accomplished by wearing a streamlined wool coat, a lady-like bag or a dressy silk top with your distressed denim. You are worth all the little effort that makes you look and feel damn good!